When ZDF German Television first asked me if they could create a segment on Dancers Among Us, I never imagined how successful it would be! My blog series recalling the day of shooting and the images I captured went viral and reached thousands, and I am now more famous than Brad Pitt in Germany! (Please don't ask me to provide statistics for that one). A huge thank you to ZDF for the wonderful exposure of sending my photography and Dancers Among Us (Tänzer Unter Uns) across the globe! A day of shooting such thrilling dance photography for this ZDF Life & Style segment, and the phenomenal responses I have received in return, have been such a highlight in my career! Will They Like Me in Kansas? 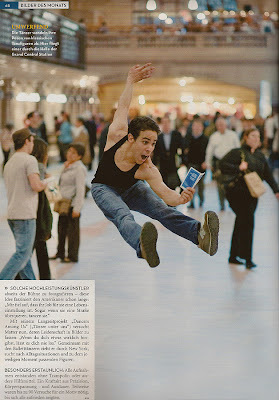 -- Dancers Among Us Goes National! Two years ago I met Paul Taylor dancer Jeffrey Smith. 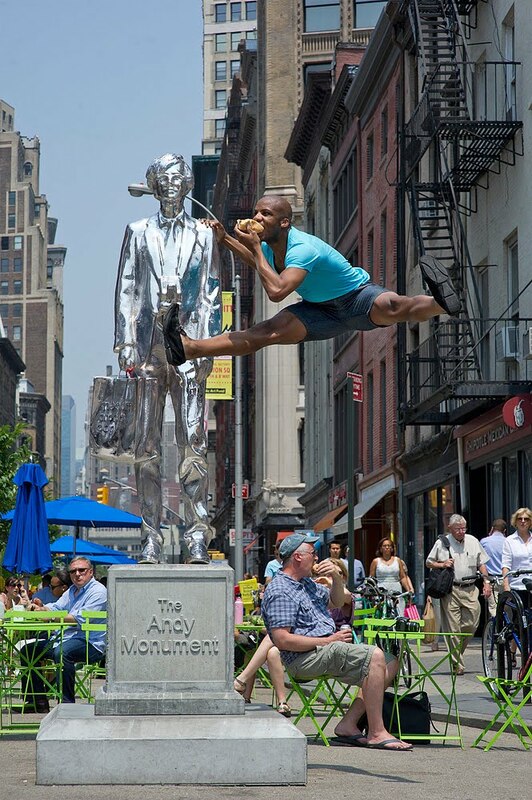 I had the germ of an idea for dance photographs- incorporating dancers into everyday situations in NYC- and Jeffrey got me access to the entire company. I had limited, okay, no dance photography experience, and I was suddenly collaborating with some of the best dancers in the world. I spent the summer of 2009 discovering the style that would become Dancers Among Us. The dancers were very enthusiastic, often returning several times with new ideas. Their commitment and creativity was invaluable, and I felt indebted to them. After Labor Day I sent thirty images to Paul Taylor, with no strings attached. The company was free to use the images in any capacity. The company manager loved them, the publicist loved them, the dancers loved them, everyone loved them... Except it didn't work with their marketing strategy at the time. I had only created the images for Paul Taylor and had no idea what to do next. The photos sat on my website through the fall and winter, and I moved on to other projects. 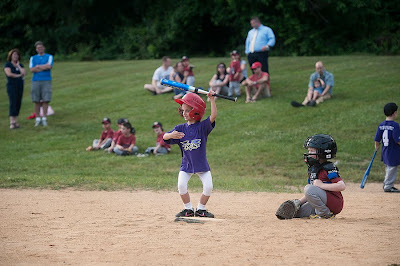 In the spring of 2010, Photo District News, prompted by tech reviewer Dan Havlik, chose an image of Annmaria Mazzini for their prestigious "Photo of the Day" website. 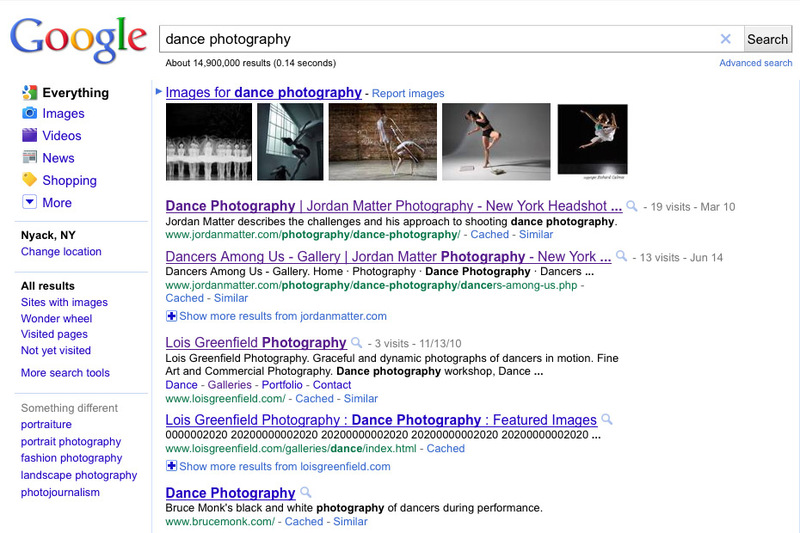 That's all it took- Dancers Among Us went viral. I was inundated with requests for interviews, phenomenal dancers started posing for me and I was flooded with congratulatory emails. I was shooting again with renewed enthusiasm. My photos were showing up on television, and in blogs and magazines around the world. After the NY Daily News feature, I received a call from literary agent extraordinaire Barney Karpfinger. He wanted to pitch a book to the big publishing houses. After months of preparation, we started making the rounds in the winter of 2010. Everywhere we went, the response was overwhelmingly positive. The editors loved it, the designers loved it, the publicists loved it, the interns loved it, everyone loved it... Except the sales departments- they were apprehensive. "It's too New York. They might not like it in Kansas." "But I've had millions of views on my website from all over the world!" I reasoned. "I'm sure some of them must have been from Kansas." Then a funny thing happened- I began to wonder if they were right. 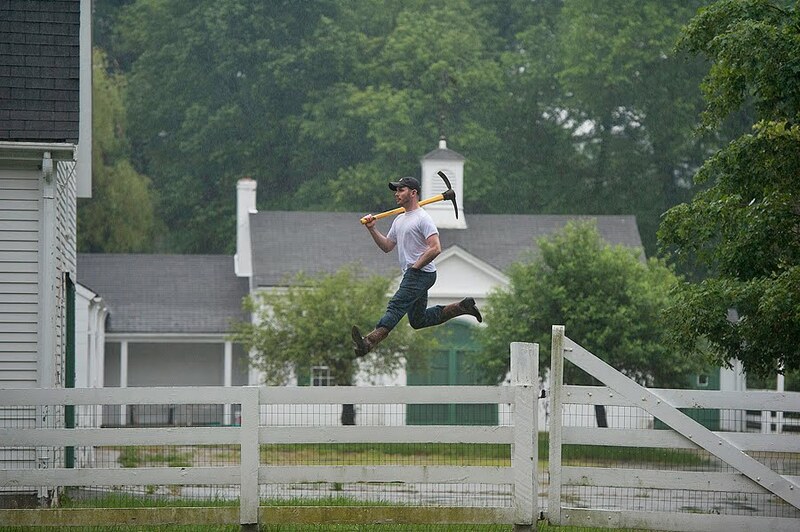 How can I represent moments in the lives of Americans without photographing America? I had always envisioned a NYC setting, but I became very intrigued with the prospect of taking it on the road. The potential seemed limitless, and I wanted to give regional dancers the opportunity to strut their stuff. Three weeks ago I began my journey by testing the Northeast waters. I've visited college campuses, suburban neighborhoods, picturesque towns and rural farmland. I have to admit, I love it- I wish I had done this a year ago! 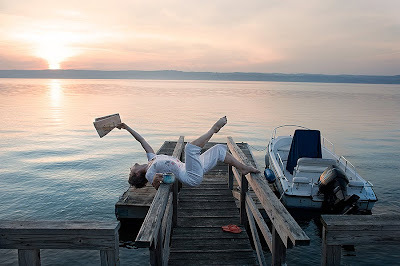 I am very excited for all the new dancers and places I will encounter and photograph this summer. 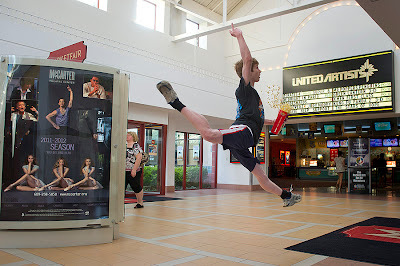 Dancers Among Us is evolving before my eyes, and it is thrilling! If you have any suggestions of great dancers or fun locations, please feel free to post your ideas on my Facebook fan page or @jordanmatter on Twitter. I'll see you soon! My blog had 45,000 reads this weekend, fueled primarily by the Dancers Among Us series last week! I owe a great thanks to posts on The Daily What, Laughing Squid, Super Punch, Tumblr, and various other personal blog sites -- this is the power of sharing! Because of you my work and passion grows! Thank you to all who are interested in my work, and to the new-comers, welcome! I'd love to hear from all of you. Please keep an eye on my Facebook fan page- lots of exciting things coming up and new adventures for Dancers Among Us happening this summer! I had started shooting Dancers Among Us with ZDF German Television at 9:00am with Marcella Guarino and the $10,000 helicopter, then met Jermaine Terry for the Andy Warhol and Lincoln Center adventures. All three situations had been extremely challenging, with the heat stifling, and I was about to attempt the most difficult shot yet. Years ago I was so excited to get my first cell phone that I couldn't wait to play with it. I was on the subway while doing so, holding a coffee. The train stopped suddenly and I spilled my coffee all over the woman next to me. 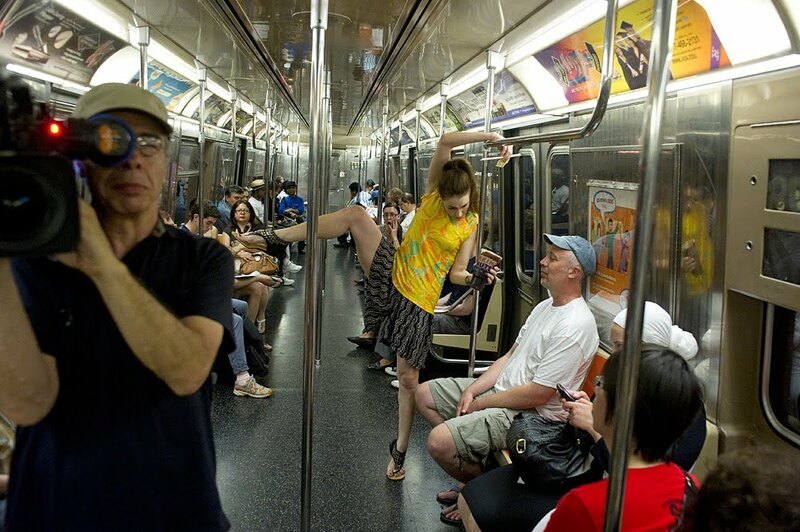 I wanted to recreate that moment now- a dancer stumbling, gracefully of course, on the subway, spilling her coffee on an innocent bystander. The dancer would be Allison Jones, whose unique physicality inspired this idea. The innocent bystander would be Geoff Legg, whose wonderful photographs often grace the pages of these posts. Geoff changed into a white t-shirt, we bought a huge iced coffee from Dunkin' Donuts, and we all climbed aboard the B train heading downtown. We had one chance to get the shot... ONE CHANCE! A single frame! After that Geoff would be stained with coffee, the ground would be wet, and the passengers would be freaked out. With the ZDF sound and camera men recording the madness, we tried to solidify a pose. The train rumbled on, speeding quickly toward Brooklyn. Allison was trying to use the bar above Geoff for stability, but her leg was getting blocked- I wanted her line to be unobstructed. Her handbag was in the way as well. We came up with a new plan and kept practicing. We rehearsed for THIRTY MINUTES! Allison was getting tired. The passengers were getting concerned. We were deep into Brooklyn. It was time to roll the dice. I asked Allison to practice one last time, just to set it in stone. All of a sudden my camera STOPPED FOCUSING. It just stopped. There was nothing I could do. We waited ten infuriating minutes. Nikon was being temperamental, focusing about half the time. People were starting to get off the train. The subway would be empty soon. Now was the time. I asked Geoff to appear asleep. I hoped Allison's position would be right, her eyes would be open, her expression would be natural, and the coffee would be arching in a steady stream, splashing Geoff in the face at the exact moment I released the shutter. Oh, and I hoped Nikon would decide to focus. "Here we go everyone. Remember to get your leg up, Allison. Hit him hard with the coffee and look surprised. Geoff, you ready? One.. Two... Three... Go!" Splash! Coffee everywhere. Mayhem ensued. The train pulled into the station. Our moment had passed. I took a breath and looked at the photo. Allison nailed it! Everything I wanted, and more. One take. In focus. Unbelievable! I wasn't even exhausted anymore. I was exhilarated. It had been the most exciting and productive day of my entire career. When we returned to Manhattan, Allison had an idea. "I could do something really cool with that phone booth." Five minutes later, I had this image. Then Jennifer Jones, who had been waiting patiently all day to shoot an homage to Marilyn Monroe on her 85th birthday, hit this shot on the first try! Thank you to everyone I mentioned in this week's Dancers Among Us blog posts- dancers Marcella Guarino, Jermaine Terry, Allison Jones, and Jennifer Jones for their amazing talents, Travis Francis for two fantastic videos, Geoff Legg for shooting and taking one for the team, and ZDF German Television for making me bigger than Brad Pitt in Europe! What an incredible day. Here is the advantage to working with a television crew: they get permits. 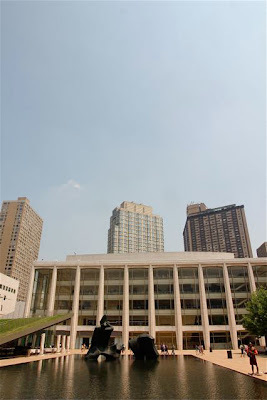 Jermaine Terry and I arrived at Lincoln Center with actual written permission to photograph there- a very rare luxury for me (thank you, ZDF German Television!). The specifics of the permit were 1) access from 1:00-2:00pm and 2) location limited to the Reflecting Pool. 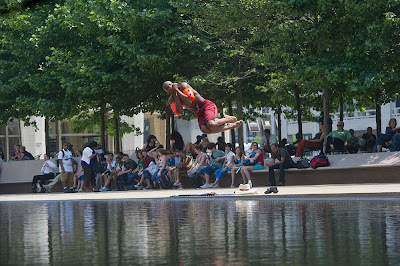 My idea was to shoot Jermaine doing a cannonball into the Reflecting Pool. He couldn't actually do a cannonball because that might cause simultaneous cardiac arrest among the security personnel, and it is also only 1 foot deep. Making it look like a cannonball was easy- perspective is a very deceptive tool. And the background was temporarily filled with kids seeking relief from the heat. Perfect contrast to Jermaine in a swimsuit. But I wasn't too pleased with the location I had selected. The Reflecting Pool was looking too much like an actual pool, so the cannonball wasn't very thrilling. It just looked like Jermaine was jumping into a public pool. The photo didn't have much drama. 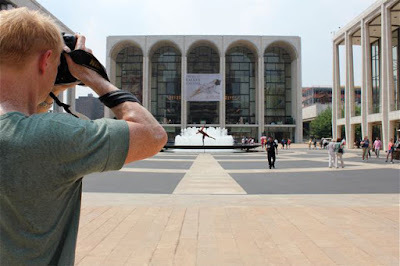 I decided to try for the Big Kahuna- the Lincoln Center Fountain. 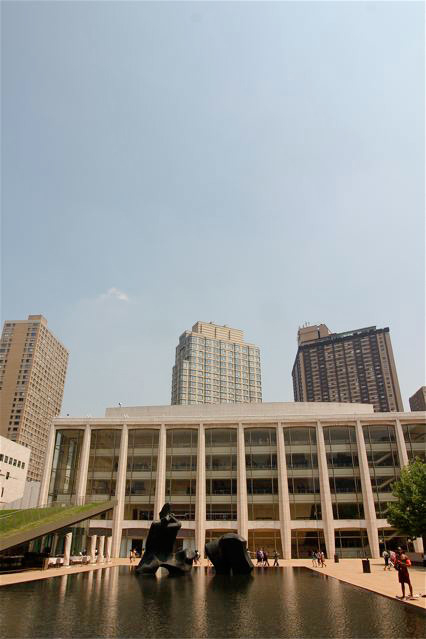 It is Lincoln Center's Fort Knox- there is a guard assigned to the fountain at all times. 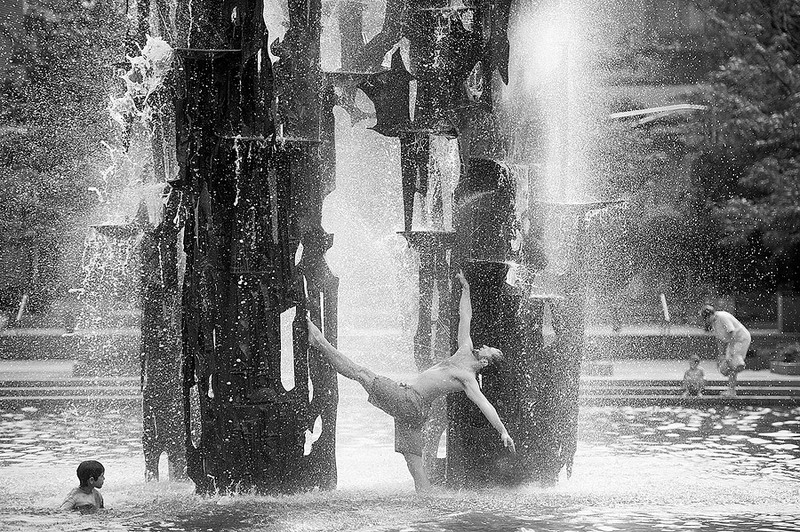 I have longed to photograph a leaping shot over the fountain for years, but I have always been kicked out before getting it. I knew we would only have a few seconds, if any, to shoot. Once I saw the giant American Ballet Theatre banner hanging behind the fountain, it sealed the deal. I had to give it a try, the setting was just too perfect. Jermaine climbed on the platform and started jumping, quietly and quickly. It looked great, but the water height wasn't at its fullest. I aimed to get Jermaine fully silhouetted against the bright water. Suddenly the jets exploded upward and I got one shot with perfect form. Then I heard that familiar NYPD whistle. I knew the officer was walking toward me, but I, of course, pretended not to notice and kept shooting. I heard him screaming before I could understand the words. "Does your permit specify jumping on the platform? DOES YOUR PERMIT SPECIFY JUMPING ON THE PLATFORM? I don't think so! It's 95 degrees and I'm getting paid! 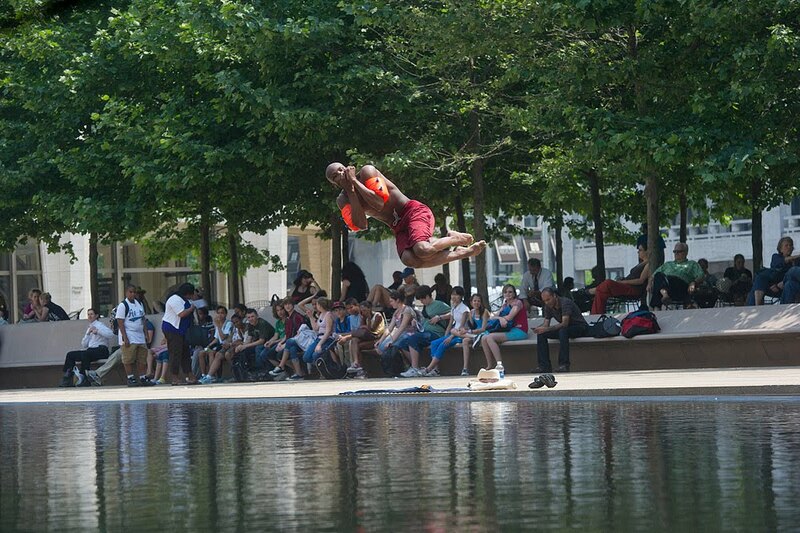 This is how we do it at Lincoln Center. He has to get off the platform and put his shirt on. Now!" "Those are the two main elements!" I retorted. "It's supposed to look like a cannonball. It won't look very good on the ground and with a shirt. So, you're killing the shot?" He smiled. "Yes I am." The officer radioed headquarters but we didn't wait around to hear what they had to say. It's amazing how quickly equipment can be gathered. I didn't get to tell him I already got the perfect shot. Success. I owe a huge thanks to the amazing Alvin Ailey dancer, Jermaine Terry for working with me and conquering the impossible, twice. 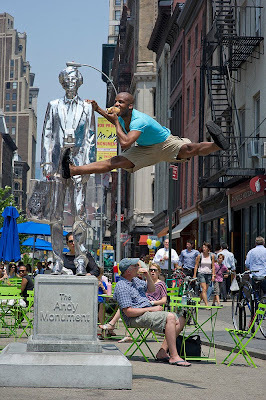 (Check out yesterday's blog post of Dancers Among Us at the Andy Warhol monument where we hear that NYPD whistle yet again!). And of course, a huge shout out to Jennifer Jones for her help and the wonderful idea of adding the arm floaties- nothing like adding the perfect prop to complete my Big Kahuna catch. As difficult as it was to photograph at the Lincoln Center fountain, it was a cakewalk compared to the next shoot of the day. Tomorrow, in the final installment of this 4-part series recalling a day in the life of photographing Dancers Among Us, I'll tell the story of capturing the most challenging shot of all. Stay tuned! I was on a high after completing the first exciting Dancers Among Us shoot of the day last Wednesday with Marcella Guarino, the helicopter, and the aircraft carrier. 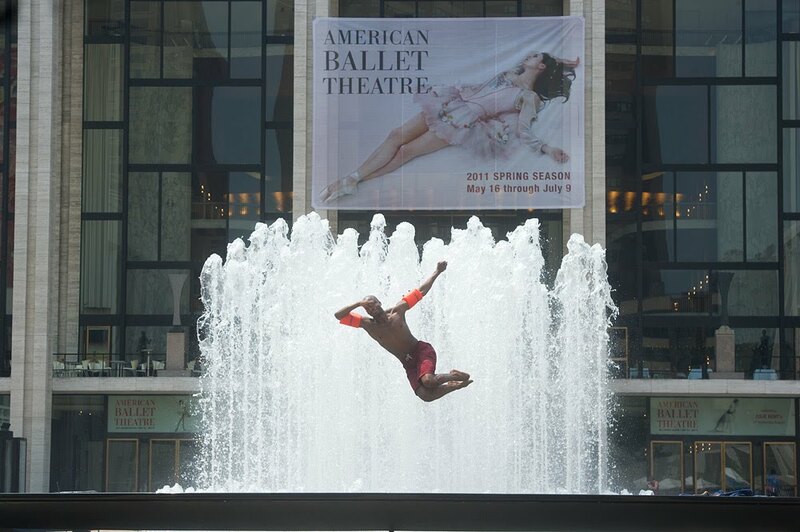 With ZDF German Television still in tow, I headed to Union Square to photograph another dancer among us, Jermaine Terry from Alvin Ailey. We had a bit of time to kill before our 2pm shoot in Lincoln Center, and I thought the Union Square Greenmarket would be a nice backdrop. Well, we never made it to the market. 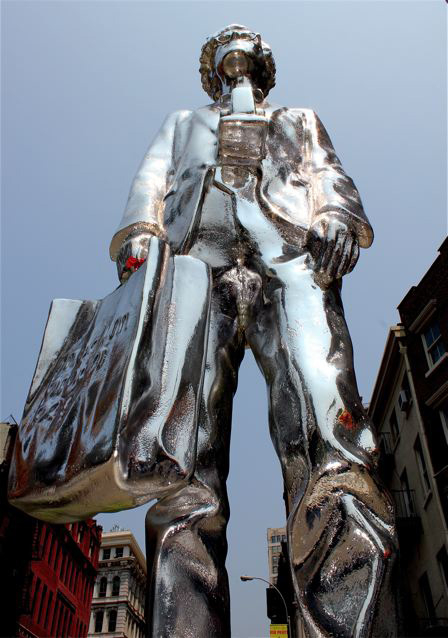 Instead my attention was grabbed by the new Andy Warhol monument on Broadway. Outdoor art installations and statues are very common in NYC, yet there is not a single Dancers Among Us photograph incorporating one. Andy Warhol seemed like the perfect premier subject. But I didn't have the faintest idea on how to incorporate him. Nothing. Not even a germ of an idea. So, I climbed up next to Andy and attempted to figure out a pose myself. 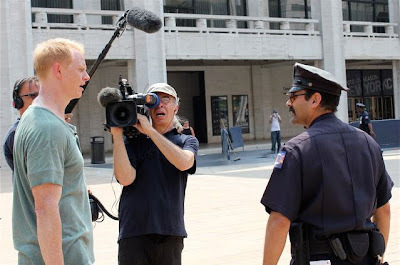 And that is when I heard the very distinct whistle of the NYPD (how I am familiar with it, I do not know). I looked over and was waved off the statue. Normally I would take that as a signal that there is some law I'm breaking, and perhaps I should think of another idea... but this is Andy Warhol! He wouldn't have walked away, right? "How about pretending you're a tourist, and you have your arm around Andy? Or what if you are mimicking Andy's pose? Okay, let's get Jermaine a camera and shopping bag... Okay, the camera looks really silly..."
Then I remembered my grandmother, Mercedes Matter. She was an accomplished artist and hater of Andy Warhol. 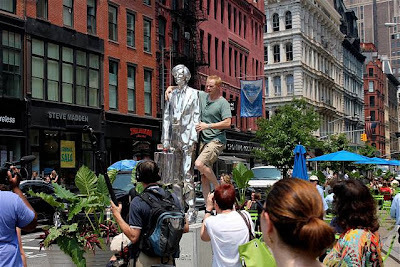 She would rail against the commercialization of art- "And that awful Andy Warhol and his absurd soup cans! That has nothing to do with art!" Light bulb. 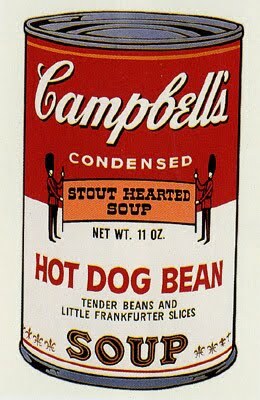 Hot Dog Bean Soup! Perfect. 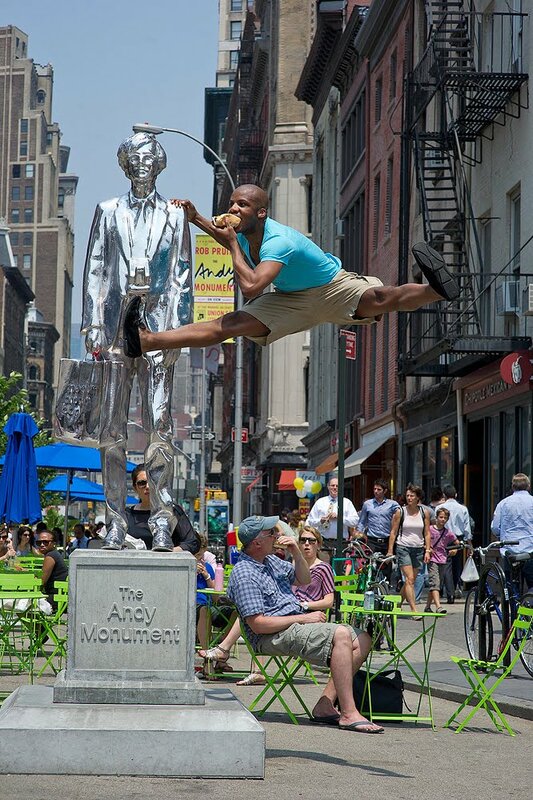 Jermaine would jump off the top of the statue, split his legs while holding Andy's shoulder and eating a hot dog, then effortlessly land 8 feet below as Geoff is eating another hot dog in the background- all before we get arrested. Amazing! This is the benefit of working with the most exceptional dancers in the world- they only need a few takes to get the perfect shot. I reviewed the photos and loved them, minus one detail- his shorts were blending into the background. If only he had lighter colored shorts. I looked around. Everyone was wearing dark shorts except... me! Got it in one take! And no handcuffs. Thanks for the inspiration Grandma. And when I say I was talking incessantly, I am not exaggerating. Check out this video by Travis Francis to see what a floundering photographer looks like. The woman I keep asking to rescue me is Jennifer Jones, star of many Dancers Among Us photos and a friend of Jermaine. The two came up with the final dance pose together (must give credit where it's due!). If you were worried about the whistle of the NYPD as much as I was during this shoot, just wait until tomorrow's post when I tell you what the police had to say about doing a cannonball in the Lincoln Center fountain. 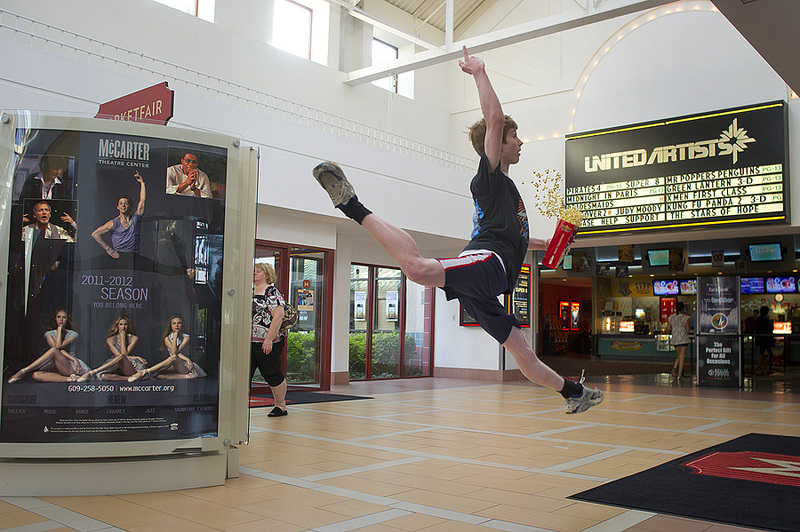 A Helicopter, an Aircraft Carrier, and a $10,000 Photograph - Dancers Among Us Reaches New Heights! 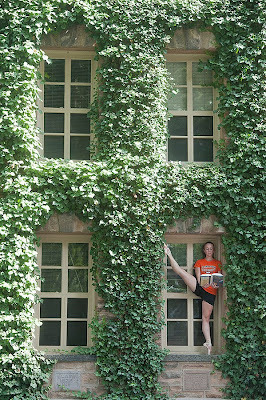 Last Wednesday I spent ten hours photographing five Dancers Among Us scenarios. ZDF German Television captured the day for a lifestyle segment to air this summer throughout Europe. It was an exciting and creative day. This is the story of the first unbelievable shoot, with more to exciting stories to follow this week. I met Marcella Guarino at V.I.P Heliport before our helicopter was due to arrive. That's what I said- our helicopter. To put this in perspective, the cost for private access to a helicopter for a photograph is pocket-change. You know, just $10,000. I have been trying for months to make this shot happen. It all centered on Marcella- she is no stranger to the helicopter experience, and she made a few calls. Late Tuesday night we got the thumbs up- we are free to shoot on the heliport. Marcella warmed up and we practiced the shot as we listened for the hum of the rotors above us. The helicopter arrived and we were ushered into the waiting area. It was very dramatic. I had 15 minutes to get the shot, and I had no idea what it would look like when we got out there. We couldn't control the direction the helicopter would be facing, that was up to the wind. And I was told the blades would be turned off- absolutely, no exception, non-negotiable. "But it would be so amazing. She's flying through the air just under the blades, and it will add this element of drama, and..."
Somehow that argument didn't sway them. I wanted Marcella to look like a socialite on her way to the Hamptons, and she pulled off the styling perfectly. But the shot was still incomplete in my mind. It was missing an element, and I couldn't put my finger on it (I am not exactly a regular at heliports). I turned to see a pilot straight out of Central Casting. Now the shot was complete. "Want to be in the coolest photograph ever?" I asked. A big dork moment, but it worked! We ran outside and got hit by a wall of sweltering heat. We started shooting and Marcella started sweating. "Great! Go again. Beautiful. Again." We took thirty shots in five minutes. We hid in the helicopter for a break from the heat. Marcella was wiped out. We reviewed the photos and saw several we liked! As we were patting ourselves on the back, relieved that we got the shot so quickly, the pilot said casually, "How about this aircraft carrier floating by? Might look good in the background." Fleet Week was over, and the sailors were passing by us at that very moment, pulled by a tugboat. We had five minutes left to shoot, and they would be gone in about two. We scurried back into the heat. Marcella shifted into gear, propelled by the drama of the moment. Everyone was ecstatic. We finished in time, and the circumstances were unbelievable. An aircraft carrier rarely passes that heliport, and we were there to witness and capture it. That alone was enough to make the shot one of my very favorites. Thank you to the folks at Heliflite for their extreme generosity, to the pilot for his amazing art direction, and to Marcella for absolutely everything else. To view an awesome video of this shoot by Travis Francis, CLICK HERE! My mother died last Monday. Two days later I went back to work. She wouldn't have been surprised. As a child I was surrounded by eccentric and creative people. My grandparents were all artists- a photographer, a painter, a pianist and an actor. My uncle is a guitarist, my father a filmmaker, and my mother was a flutist. That's everyone. A small but highly artistic family. I grew up the only child of divorced and impulsive parents. We moved a lot. Extreme behavior seemed normal to me, and I hated the instability of their Bohemian and irresponsible lifestyles. I envied the stable, suburban upbringing of my friends. I wished my name was John and that my parents were accountants. I went off to college and declared my major- Economics. That lasted one semester. I never stood a chance. The fear of instability of an artistic life was trumped by the fear of boredom. With death comes reflection. My mind has been frantically racing against time, storing up memories before they begin to fade. As I think back on my childhood with her, one image dominates my mind- my mother playing scales on her flute. Every day. For hours. And it would drive her crazy. As a child I found her perfectionism infuriating- every "Aggghhh!!" meant I would have to listen to another scale. Now I find it inspiring. Music was her lifeblood. Whenever she was having a difficult time, which was often, she reached for her flute. As she played, her sanity was briefly restored. Now I find myself in crisis, and I have reached for my camera. Photography has helped restore my sanity as well. I do not intend for this to be a eulogy, and I am wary of revealing such a personal and painful journey. But my mother's death has helped me realize how lucky I am, and I feel compelled to share it. While many people mourn privately and stay away from work as long as possible, I felt an urgency to return. I am living my passion, and I know how rare that is. Photography doesn't just make me happy, it makes me whole. Today I am running around NYC, photographing Dancers Among Us. I am being filmed by ZDF German Television- they are doing a segment on me to air throughout Europe. On Friday I will be meeting with publishers about a book and calendar collaboration. These events are a culmination of two years of work, and I wish my mother was here to share it with me. I did not mention these new opportunities to her, nor did I acknowledged her role in shaping my passion. The best I can do is acknowledge her now, and continue forging a path that would have made her proud.